Round brilliant cut diamond stud earrings, from classic four claw settings, to minimal two claw designs, offered in a full range of options by way of style, diamond colour, clarity and carat weight. Timeless round brilliant cut diamond stud earrings, featuring a 4 claw rex setting, with a wide choice of diamond specifications. Four claw settings. Round brilliant cut diamonds. Weight shown is total weight for the pair. Solid wood box. Available in 18ct White Gold, Yellow Gold and Platinum. Total diamond weight shown. 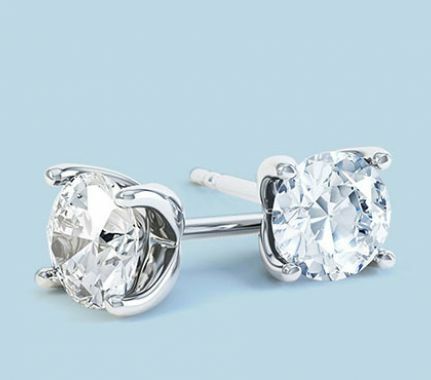 Diamond stud earrings inspired by simplicity. The Paris design are a favourite due to their modern styling and open design. They remain a contemporary classic earring design framing a pair of dazzling round brilliant cut diamonds. Each carat weight option represents the total weight for each pair of diamonds. Simple four claw setting. Available in 18ct Yellow Gold, 18ct White Gold and Platinum. Total diamond weight specified. Contemporary and elegant four claw setting. Approx. 3 weeks delivery. Modern classic four prong diamond stud earrings with round brilliant cut diamonds. Modern classic design. Four claw setting. Available in 18ct Yellow Gold, 18ct White Gold and Platinum. Total diamond weight specified. Approx. 3 weeks delivery. The 'Millie' diamond earrings feature classic 6 claw earring settings, in a classic round diamond stud earring design. Elegantly crafted, each pair of earrings hold a matching duo of round brilliant cut diamonds. Select your total carat weight and enjoy beautiful craftsmanship, beautifully presented in bespoke Serendipity packaging. Available in a wide choice of diamond carat weight option, diamond quality choices and a range of precious metals. Choose from 18ct White Gold, 18ct Yellow Gold and 950 Platinum. Fairtrade Gold earring options are also available. Select your total carat weight from our menu below. Includes 2 extra pairs of Lox security earring backs with each order. See our item description below for more information. Pair of round brilliant cut diamond stud earrings with a classic tapering full bezel setting. Rub over setting. Available in 18ct Yellow Gold, 18ct White Gold and Platinum. Total diamond weight specified. Classic bezel set design. Approx. 3 weeks delivery. Captivating 4 claw diamond stud earrings, created with a Tiffany inspired crown setting, holding perfectly matched round brilliant diamonds. Four claw settings. Lotus design. Supplied with push-on single click butterfly backs, and supplied wood boxed and gift packaged. Approx. 3 weeks delivery time. Affordable luxury, across this charming pair of diamond stud earrings, styled as part of the Entwine collection. 950 Platinum. Part of the precious platinum collection. 2 x 2mm round brilliant cut diamonds. 0.06cts total diamond weight. Set into 950 Platinum two claw settings with push on backs. Wood boxed and gift packaged. Approx. 2 weeks for delivery where unavailable from stock. Elegant diamond halo earrings set with a central round diamond, encircled by a halo of outer round brilliant cut diamonds. Central round diamond. Choose from a wide range of carat weights. Carat weight chosen is for the pair of central diamonds. We then add the matching round diamonds, with an additional 0.25cts to compliment this. Available in a wide range of colours and clarities. Please allow 3-4 weeks for completion of this elegant pair of modern diamond earrings. Dazzling with simple elegance – each pair of Isis diamond stud earrings radiate elegance with simple three claw settings revealing a perfectly matched pair of round brilliant diamonds. We create each pair of Isis solitaire earrings, working to your perfect choice of precious metal. Select your total carat weight across this captivating, contemporary styled earring design. Each pair of earrings is made just for you, and delivered to your door within 3 - 4 weeks of placing your order. Enjoy the sleek, modern styling from this sparkling pair of brilliant-cut diamond earrings. Featuring a mirror-polished bezel setting, we select a perfect pair of round brilliant diamonds, crafting each pair of bezel set diamond earrings to order. Rubbed-over bezel design. Mirror polished edges. Round brilliant-cut diamonds. Wide choice of carat weights, diamond colours and clarity options. Choose from a wide selection of precious metals. Please allow 4 weeks for delivery. Presented in luxurious packaging and presentation earring box. Alluring knot styled diamond solitaire earrings, crafted with perfectly matched round brilliant cut diamonds. 4 claw setting. Round brilliant cut diamonds. Knot style detail created in 950 Platinum. Choice of diamond sizes, colour and clarity. Wood boxed, gift packaged, approx. 14 working days for delivery. Contemporary round brilliant cut diamond stud earrings, with a simple 4 claw basket styled setting. Four claws.Contemporary design. Round diamonds. Total weight stated. Wooden boxed. Gift packaged. Available in 18ct White Gold, Yellow Gold and Platinum. Total diamond weight shown. Approx 3 weeks delivery. 3 claw Round Brilliant cut diamond stud earrings, with a minimal open three claw setting to reveal the brilliance of each diamond. Three claw setting. Open design allows light into diamonds. Supplied boxed. Gift packaged. Choice of sizes. Available in 18ct White Gold and Yellow Gold. Total carat weight shown. Please allow 2-3 weeks for delivery. Enjoy the sparkle from this modern pair of part-bezel set diamond earrings. Simply styled, the design is understated, elegant and modern with a wide choice of diamond quality and size options in a selection of precious metal choices. Partially bezel set. Round brilliant cut diamonds. Various size options. Secure fittings. Supplied in a luxurious presentation box. Gift packaged. Total carat weight shown. Available in 18ct White Gold, Yellow Gold and Platinum. A pair of beautifully polished, round brilliant cut diamond earrings with a smooth, rounded full bezel doughnut style setting. Round brilliant diamonds. Simple and elegant design. Rounded bezel settings. Choice of options. Wood boxed. Gift packaged. Total weight shown. A pair of modern-classic round diamond stud earrings, with a simple, uncomplicated cylindrical full bezel setting. Round brilliant diamonds. Full bezel setting. Straight sides. Butterfly attachments. Wood boxed. Gift packaged. Total diamond weight shown. Please allow 2-3 weeks for delivery. Exquisite Rosebud styled, diamond solitaire earrings, set with perfectly matched round brilliant cut diamonds. Exclusively 950 Platinum. Round brilliant cut diamonds. Total weight specified for both diamonds. Earrings supplied in wood box, in our branded outer box, securely delivered in a 2-3 weeks timescale. The round brilliant cut with its 57 facets is quite simply a brilliant choice for diamond earrings. Set into any one of a number of variant designs, with settings composed of two, three, four or even six claws, there are styles to match the original engagement ring. 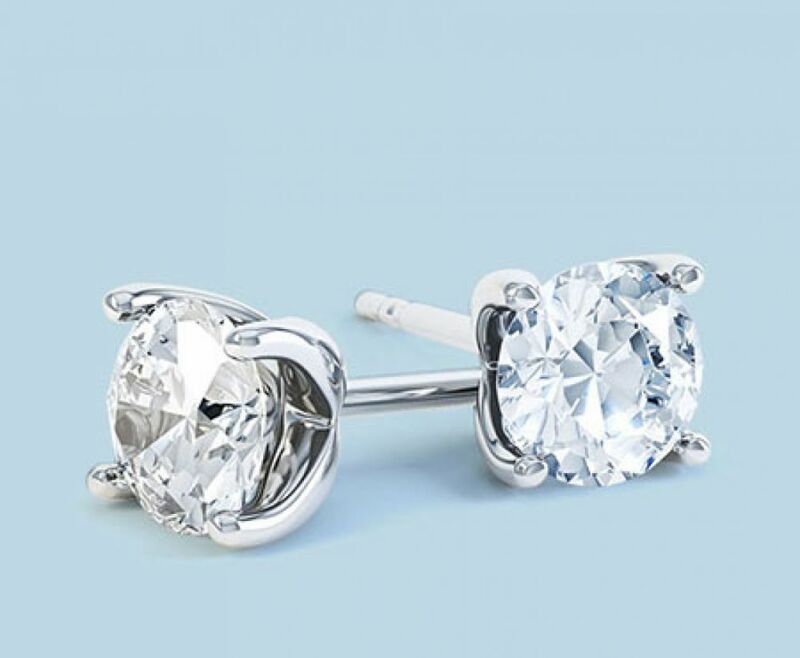 A wedding day gift of round diamond stud earrings has to be one of the most popular choices for a groom currently and we can vary the purchase according to a personal budget. Our guide offers many stud earring designs, and our range will not only reveal the choice of round styles, but also many others set with fancy shapes of the diamond. Talk to us about colour, clarity and carat weight and we will advise on what works best. There are factors that will also influence the metal choice since metals such as Platinum will not always be essential for items that do not exhibit wear and tear. Earrings are one of those purchases that will remain with you for many occasions and to ultimately pass on to a loved one. The choice, therefore, needs to be well considered, and a well-cut round brilliant, with full scintillation and sparkle, will be a wonderful choice, which can be provided in one of many classic designs.